With four games remaining in the regular season, the Badgers sit alone in third place with 28 points, one better than Michigan and three points ahead of Penn State. The Gophers are in sixth place with 23 points, but has played two fewer games. Notre Dame leads the Big Ten with 47 points and will face second place Ohio State (34 points) this weekend. The Irish can lock up the Big Ten regular season title with a victory. Wisconsin head coach Tony Granato will miss the weekend series. He’s in PyeongChang, South Korea, serving as head coach of the 2018 U.S. Olympic Team. Associated head coaches Mark Osiecki and Mark Strobel will run the team in his absence. 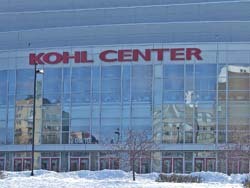 The Badgers are 7-7-3 at the Kohl Center this season with a chance to finish with a winning record at home for the first time since the 2013-14 team went 17-2-1 at the Kohl Center. Saturday night’s final regular season home game is a sellout.